The night is covering its alleyways with a dark cloak, leaving only a few areas lit by the gaslights. Eight investigators have come together to track down Mr Jack, still at large. 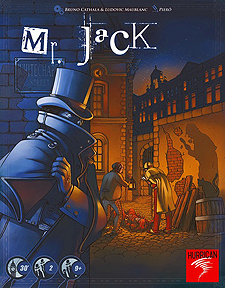 Mr Jack is an asymetric game for two player. Each player has a different aim. One takes on the role of the Detective, the other Mr Jack. The Detective must unmask Mr Jack's cover and then catch him. Mr Jack will try to use the cover of darkness to slip away while doing his best to slow down the investigation. Using successive deductions, by moving characters in and out of the darkness, the Detective will reduce the number of suspects and tighten the noose around Mr Jack. Will he capture Mr jack before the end of the eighth turn? Mr Jack is a tense game of light and darkness.